An aircraft skidding off the runway is all it takes to ruin anyone’s vacation plans. Unless you’re living in California or Florida, just about everywhere north of the equator feels the bite of winter in January. 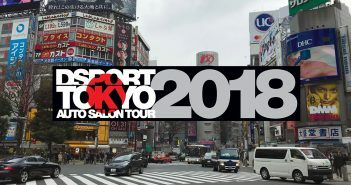 That chill caused an aircraft to skid off the runway at JFK International Airport, prompting the cancellation of numerous flights out of America’s northeast just days before the 2014 DSPORT Tokyo Auto Salon (TAS) Tour was due to take off from Los Angeles. At least six attendees faced this obstacle and smacked it down. Some caught alternate flights the next day, while others drove down to Philadelphia to fly out to the West Coast. Raul O’Brien was so determined to make the trip that he ended up flying to Miami, spent the night there, then flew to L.A. by way of Las Vegas. His luggage had already been checked in with the canceled flight’s airline but wasn’t scheduled to arrive in L.A. until just before the flight left for Japan. DSPORT put together a special SWAG bag for O’Brien, containing a DSPORT hoodie, toiletries, some new underwear and sweats, in case he went to Japan without luggage. Fortunately, his bag arrived in the nick of time. In addition to the difficulty for some just to get to Japan, there were more “fun” experiences waiting for us when we landed. On top of arriving at the same time as another international flight and waiting for what felt like forever to get through customs, the money exchange at Haneda International Airport was not equipped to handle a tour full of American car enthusiasts anxious to convert dollars to yen. We missed the last train and had to take a bus to the Shinagawa Prince Hotel, our home for the next week. Things started to fall into place once we arrived at Shinagawa. 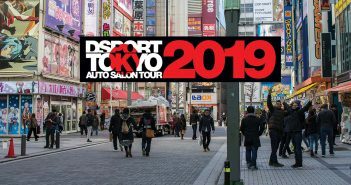 With the hotel located conveniently across the street from Shinagawa Station and central to most of Tokyo’s attractions, it has served as the home base for the DSPORT TAS Tour since 2009. After getting a partial night of sleep, the tour hit the ground running. Starting with a bus ride to Nissan’s old Zama assembly plant, our group enjoyed an exclusive visit to the Nissan Heritage Museum. With examples ranging from the earliest machines, like 1930s Datsun models, Prince Skylines from the 1960s and Nissan’s S30 Fairlady Zs up to today’s R35 GT-R, over 400 vehicles chronicled the company’s long and illustrious history. 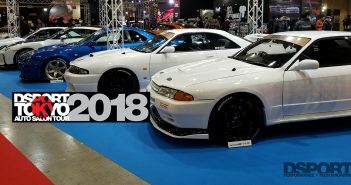 Numerous racecars that Nissan campaigned in a variety of disciplines, from rally to Super GT, were also displayed, along with rare machines like a one-of-a-kind, street-legal R390 GT1 Le Mans and a widebody R33 Skyline GT-R LM. Some Nissan engineers and other staff were on hand to serve as tour guides during our walk through Nissan’s history. These knowledgeable individuals shared interesting facts, details and the background of key vehicles in the collection, helping us to understand why the cars were built the way they were. After leaving Zama and taking a lunch break at Gandberry Mall, it was off to Yokohama, where we visited TOMEI Powered. Allen Lorenzo greeted our party, and we were given a tour of the facility. While TOMEI Powered is generally known for its camshaft development and production, Lorenzo told us about, not only its camshaft grinding capabilities, but also the company’s engine development departments, which included cylinder head tuning, engine building, and engine testing on an engine dynamometer. Outside the engineering department’s doors, we walked to a small courtyard to see Kenji Yamanaka’s Mark II drift car, along with a supercharged FR-S development vehicle and a USDM S14 240SX powered by a turbocharged KA24 engine. At the end of the building, the doors were open to the dyno cell, where TOMEI Powered showcased its new Dyno Dynamics AWD dynamometer. To wrap up the day, the tour went shopping at UpGarage. UpGarage is famous for its second-hand performance parts and bargain prices. Most in our group walked away with a variety of parts, from headlights and taillights to a Recaro seat.